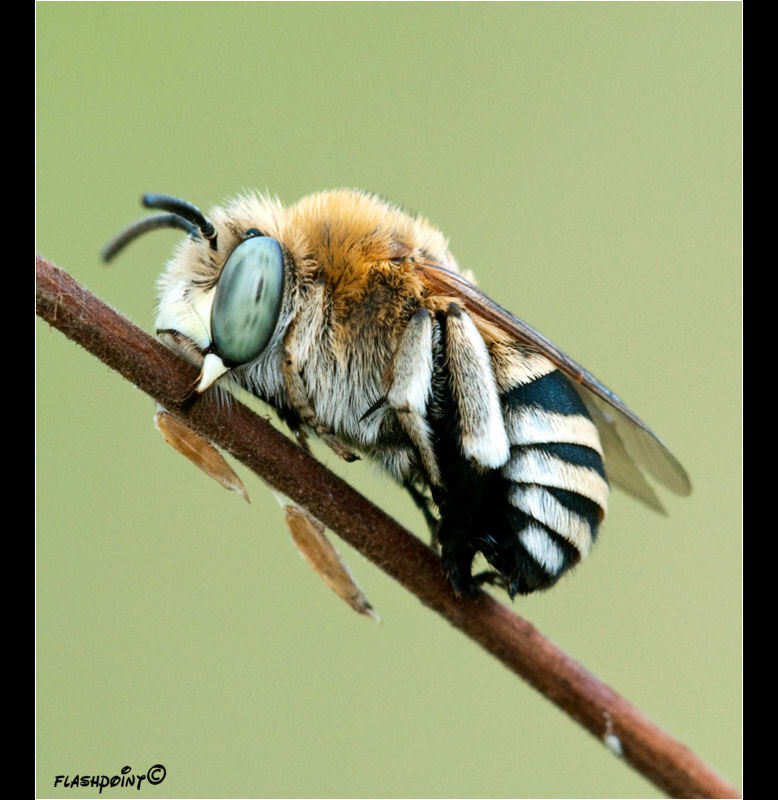 The bee genus Anthophora is one of the largest in the family Apidae, with over 450 species worldwide in 14 different subgenera. They are most abundant and diverse in the Holarctic and African biogeographic regions. All species are solitary, though many nest in large aggregations. Nearly all species make nests in the soil, either in banks or in flat ground; the larvae develop in cells with waterproof linings and do not spin cocoons. Males commonly have pale white or yellow facial markings, and/or peculiarly modified leg armature and hairs. Anthophora individuals can be distinguished from the very similar genus Amegilla by the possession of an arolium between the tarsal claws. IT is a nice capture. The subject is very interesting. I like very much the eye. Good sharpness, colours and composition. Amazing picture with great colours, excellent details and perfect focus. Nice capture with lovely green background. Ciao Sergio. Per me un capolavoro! Guardandola dal punto di vista di MF forse un po' tenera. Un disallineamento molto leggero de DOF in testa, ma a chi importa? Avete completato l'arte foto! Saluti, Buona Domenica per voi! Hi Sergio. super macro photo of this bee! Details, POV and composition are impressive. The whole photo is impressive but that eye is spectacular. I've never seen a bee quite like this before. ciao sergio. wow che bella foto ! nitidezza perfetta e colori molto naturali. mi piace molto. grazie. catia.